Generates a pixelated version of the source clip. 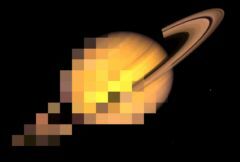 This is similar to Mosaic but a Mask input specifies which areas of the Source are to be pixelated. Mask: The effect is applied only at Source areas specified by this Mask input. For gray values in the mask, the pixel blocks are mixed with the original source such that the blocks fade but remain whole. Only the red channel of this input is used. The mask can optionally be blurred or inverted using the Blur Mask or Invert Mask parameters. Pixel Frequency: Default: 40, Range: 1 or greater. The frequency of the pixel blocks. Increase for more numerous, smaller pixels. Pixel Rel Height: Default: 1, Range: 0.01 or greater. The relative height of the pixel blocks. Increase for taller blocks, decrease for wider ones. Pixel Shift: X & Y, Default: [0 0], Range: any. The translation of the pixel pattern. Smooth Colors: Default: 0, Range: 0 or greater. Blurs the source before pixelating. Increase to cause the colors of nearby pixel blocks to be more consistent, and less flickery over time.